Rated ‘PG-13’ for action/peril, bloody images and some language. Stars Jason Statham, Li Bingbing, Rainn Wilson, Ruby Rose, Winston Chao, Page Kennedy, Robert Taylor, Sophia Cai, Jessica McNamee, Masi Oka, Cliff Curtis. Despite its general faithfulness to the man-versus-monster formula, The Meg turns out to be a fun romp thanks to a likeable cast and the filmmakers treating the absurd premise with the appropriate level of gravitas without going over the top. The film is based on a 1997 novel about a long-extinct giant shark called a megalodon emerging from an isolated section of the ocean to terrorize modern times. In adapting the story, director Jon Turteltaub (National Treasure) manages to blend the research premise of Deep Blue Sea with the imperiled tourist angle of Jaws, and add a healthy dose of modern visual effects to deliver an effective if not always engrossing action thriller. The film looks great, and the Blu-ray really nails the beautiful blues of the ocean vistas, even if the CGI becomes a bit too noticeable at times. The plot involves a deep-sea research platform sending a submarine to explore a hidden realm of the Marianas Trench previously cut off from the rest of the ocean thanks to some mostly convincing pseudo-science. Soon enough, the sub is attacked by a large creature and trapped, leading the station to call in deep-sea rescue specialist Jonas Taylor (Jason Statham). There’s some rumbling about Jonas being nuts because he claims a giant creature screwed up a previous rescue, but that’s mostly some conflict to build tension among the human crew. Suffice it to say, Jonas’ rescue attempt allows the creature to get past the trench’s natural barrier, which let it evolve in its own unique ecosystem for millions of years, and up to the surface, where there are plenty of delicious boats and beachgoers it can play with. And since the megalodon is basically a giant shark 10 times bigger than a great white and capable of biting a humpback whale in half with one chomp, the platform’s financier (Rainn Wilson) and his team are eager to blow it up before it can do much harm. The Meg isn’t overly reverential of previous shark movies, though audiences familiar with them will certainly recognize the foibles of this crew’s attempts to stop the threat. Attacks are played for either shock or humor, depending on who is getting swallowed whole, and there are even quieter moments that allow the characters to express some emotion as they deal with their colleagues, friends and family members getting killed. Statham’s Jonas character is of a certain aquatic adventurer archetype that one could imagine another franchise entry subjecting him to any number of quests along the bottom of the ocean that don’t necessarily involve him fighting giant sea monsters, though it’s pretty much a given that any sequel would put him up against another menacing beast. The original book’s author, Steve Alten, has written a series of sequel and prequel novels about prehistoric carnivores, so when the time comes to cash in on The Meg’s box office success with a follow-up movie, the filmmakers will have no shortage of source material from which to pick. 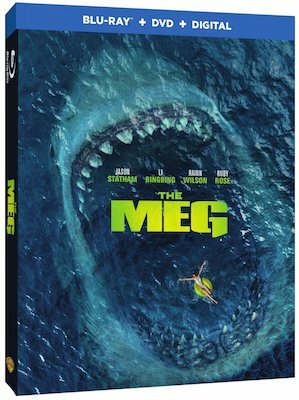 The Blu-ray arrives rather light on bonus materials, sporting just two decent featurettes: the 12-minute “Chomp on This: The Making of The Meg,” covering the production as a whole, and the 10-and-a-half-minute “Creating the Beast,” which focuses on the shark. Movies Anywhere also offers a two-minute promotional video about filming in New Zealand.